Brighten up your rainy days with Brother Philippines Rainy Season Treat Promo! There’s no reason to be gloomy this rainy season and more reason to be excited as Japanese home and office imaging leader Brother Philippines brings you another jolly treat! Yes, Brother Philippines has brought back their partnership with Jollibee with the Rainy Season Treat promo. The Rainy Season Treat promo features participating printer models under Brother’s Refill Tank System Series that are best for small office and home office printer users, as well as home, school, and personal printer users. Under the promo, customers purchasing any participating product may redeem corresponding meal packages at the country’s number one fast food chain. Maximize productivity and carry out your imaging tasks at the fastest, least hassle and most affordable way possible with the Brother Refill Tank System printers. Enjoy user-friendly design engineered to minimize the risk of mess and leakage, a document print speed of up to 12/10 ipm (impressions per minute) that lets users do more in less time, and ultra-high-yield ink bottles – up to 6,500 pages in black and 5,000 pages in color – that lower cost per print. Under the promo, customers purchasing the Brother MFC-T910DW Color Inkjet Printer get P1,500 worth of redeemable Jollibee meal packages. Meanwhile, buyers can get P1,000 worth of Jollibee treats for every purchase of a Brother DCP-T310, DCP-T510W Color Inkjet Printers, DCP-T710W, MFC-T810W Color Inkjet MFC Printers. Customers who qualify for the promo must log on to promotions.brother.com.ph and register to get a corresponding bCODE to their purchase. To redeem the meal packages, customers will need to present the email containing the code at any of the participating Jollibee stores nationwide under this promo, which runs until November 30, 2018. 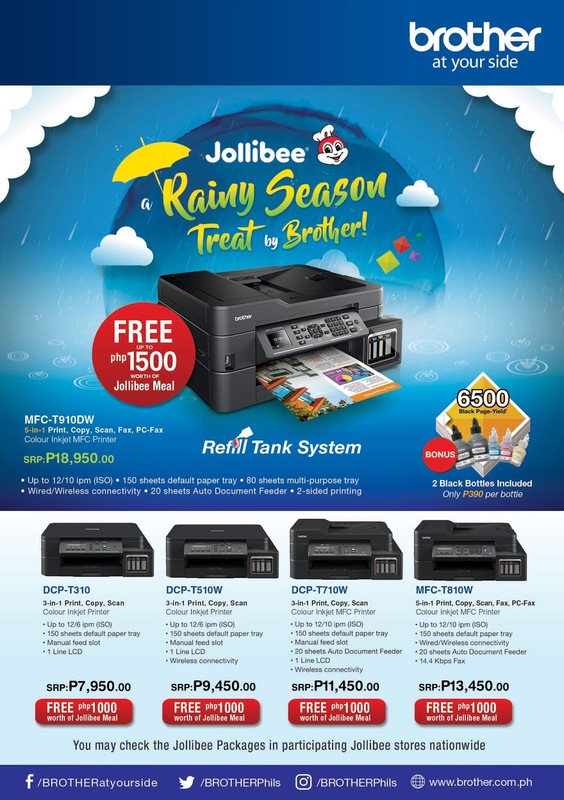 Hurry now and grab a Brother Refill Tank System printer from an authorized Brother dealer to avail of these cutting-edge features, as well as the Jollibee treats that go with every purchase. Log on to www.brother.com.ph and https://promotions.brother.com.ph for more information on Brother Philippines and the Rainy Season Treat Promo.